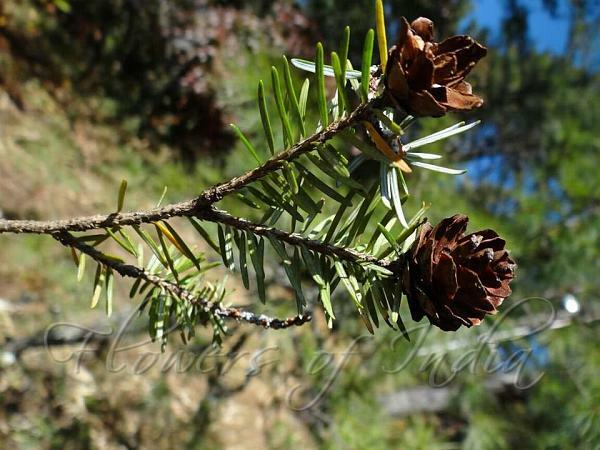 Himalayan Hemlock is a coniferous tree growing 20-25 m tall. The diameter at breast height is typically 40-50 cm, but can be beyond 100 cm. The crown on small trees is ovoid and their form is like that of pendulous bushes - in fact, the species name dumosa means bushy. Older trees tend to have multiple stems from one or two sinuous boles, especially in cultivation. The crown of mature trees is broad, irregular-pyramidal and open. The bark is somewhat pinkish to grey-brown and heavily ridged with broad, shallow, flaky fissures. Branches are oblique or horizontal. The twigs are reddish brown or greyish yellow in their first year and are softly hairy, 2-3 years old are greyish brown or dark grey with leaf scars. The leaves are spirally arranged, pointing forward on the branches. They are linear in shape, and 1.0-2.5 cm long by 2-2.5 mm wide. The ends are obtuse or rounded, and very occasionally emarginate. The upper surface is green and shiny, while the undersides have 2 wide silvery stomatal bands. The upper half of the leaves usually have small dents on the margins, i.e. the margins are rarely entire. Male flowers are globose in shape, solitarily arranged and axillary. The anthers are a green-yellow in colour and they lack an air sac. Female flowers are round-ovate in shape, also solitarily arranged, terminal and slightly down-curved. They have many spiral scales with 2 ovules contained within each scale. The seeds are about 9 mm long, ovate in shape, brown in colour and have thin wings in their upper parts. 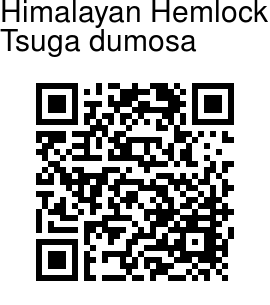 Himalayan Hemlock is native to the eastern Himalayas, from Kumaun to Bhutan, N. Burma, at elevations of 2100-3600 m. Flowering: April-May. Identification credit: Soni Bisht Photographed in Gangtok, Sikkim & Dharchula, Uttarakhand.